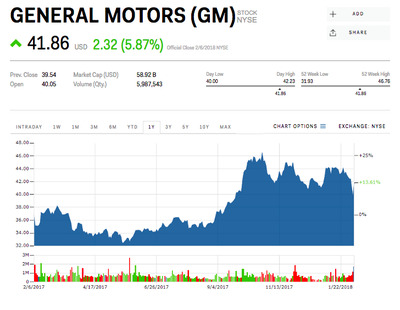 GM could be seriously considering leaving the South Korean market. The company operates GM Korea there and has done so since 2002. The move would follow an exit from Russia and the sale of Opel to PSA in 2017. General Motors and CEO Mary Barra made news last year when the company sold its long-underperforming Opel division to the PSA Group for $US2.3 billion. This followed moves to leave the Russian market and to end vehicle production in Australia. Barra’s relentless focus at GM has been to maximise the carmaker’s return on invested capital. If a region isn’t performing up to expectations, Barra isn’t going to hang on – she wants to spend money to compete in the US and China, and to be invested in new technologies, such as electric vehicle and autonomous mobility. After GM announced strong fourth-quarter and full-year 2017 earnings, Barra and CFO Chuck Stevens joined analysts on a conference call – and dropped another bombshell. Now that GM has largely exited Europe, South Korea could be next. “Clearly, Korea is a challenge for us,” Barra said in response to a question from Morgan Stanley’s Adam Jonas. She then explained that GM is already talking to the relevant stakeholders for its South Korean operations. The end of GM Korea – which dates back to before the financial crisis and GM’s bankruptcy, when the carmaker acquired Daewoo in 2002 – has been rumoured for a while. But it now sounds as if the discussion about the future of the company’s investment there may have reached a critical juncture. Of course, GM would have to devise an exit plan. The PSA Group was prepared to take over Opel, while leaving Russia meant that the Chevy brand would no longer be sold there. GM Korea operates multiple plants and gives the carmaker a manufacturing hub in Asia that isn’t located in China. GM shares closed up almost 6% on Tuesday, to $US42.